Turn heads. The leather Loxodonta combines all of the function ASHARD RICHLEY provides. Featuring two full-sized, overlapping pockets, a built in wallet, and removable strap belt, the Loxodonta can carry all of your necessities. An added bonus is that it holds the iPad! It's dually functional and transitions smoothly from a chic evening bag to an eye catching iPad case. 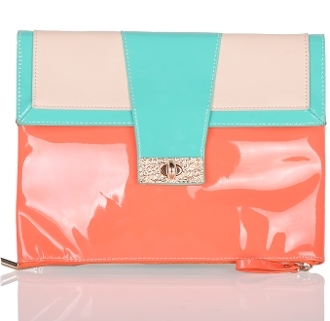 ASHARD RICHLEY’s calfskin and patent Loxodonta is available in CORAL | TEAL.